No I didn’t jump on a plane and fly to California! 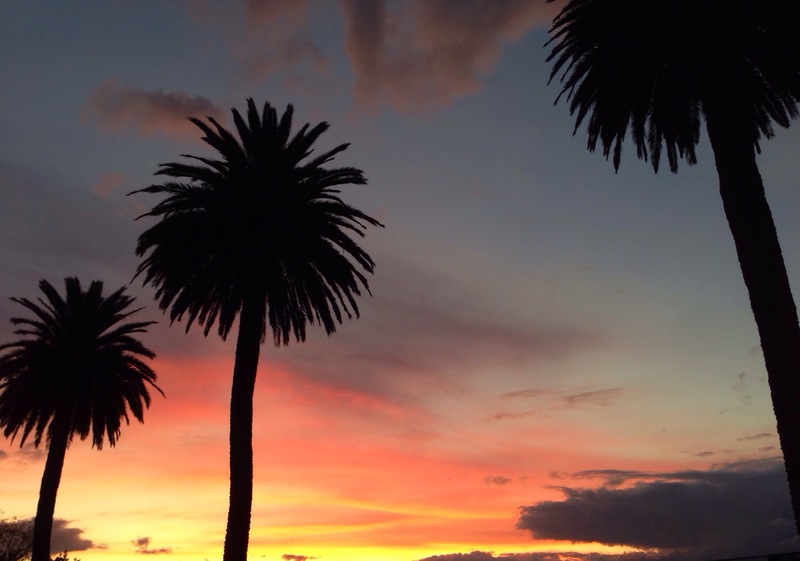 This sunset photo was taken out of the car window from the side of the road in Napier. Yep, Napier. There’s a street lined with these iconic tropical palm trees, and we just happened to be on it when the sky turned on this vibrant sunset beauty. There’s another main beachside road that’s lined with really big old established Norfolk pine trees too, it’s stunning. And there’s the roaring beach, with huge waves that smash into the little black pebbles that line the very steep shores. We stayed a couple of km’s from the beach and could still hear the waves crashing into shore during the quiet wee hours of the night. All that in a town that’s full of beautiful classic Art Deco architecture too. Oh and the freshest yummiest fish & chips. Not to mention a yarn mill. A very cool stop on the NZ roadtrip. This entry was posted in Photography, travel and tagged new zealand, postcards, sunset, travel. Bookmark the permalink.